Vitamin B12 1,200mcg - timed release for a gradual release over a 6 to 8 hour period. Vitamin B12 is an essential nutrient and member of the B Complex family. It prevents nerve damage, and promotes growth, cell development, and blood-cell development. It is also required for proper digestion, the synthesis of proteins, and the metabolism of carbohydrates and fats. Required for healthy nerve fibers. Plays important role in energy production, immune and central nervous system function, and in Folic Acid metabolism. Prevents the accumulation of homocysteine in the blood. Helps with fatigue, general weakness, mood swings, even appetite loss. Each tablet contains: Vitamin B12 (Cyanocobalamin) 1,200mcg. 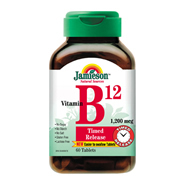 Each tablet provides for a gradual release of Vitamin B12 over 6 to 8 hour period.